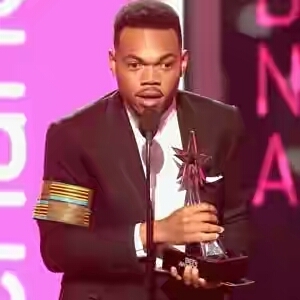 Chance the Rapper was honored with a Humanitarian Award at the 2017 BET Awards, and the artist delivered a stirring speech that brought the audience to their feet with a message of hope and a call to action. Before the 24-year-old rapper took the stage to accept the honor, he was introduced with a surprise video message from former First Lady Michelle Obama. "We are so incredibly proud of you, Chance," Michelle said, on behalf of herself and husband Barack Obama. "We have known Chance and his family since he was a wee little baby rapper, and it has been a thrill watching him come into his own in so many ways." "In addition to making some really amazing music, Chance has been taking that big bright spotlight that follows him around and he's shining it on young people in our hometown of Chicago," she continued. "Time and again, he has been standing up, speaking out, and doing the work to get kids in our community the education they deserve. And with these passionate efforts, chance is showing young people that they matter." Michelle want on to call the artist an "outstanding role model and an inspiration to all of us who care about our next generation." Chance has been an outspoken advocate for the public school system in Chicago, and has been at the frontline of several fundraising campaigns. Earlier this year he donated $1 million to Chicago public schools. The young star graciously accepted the award and addressed the audience, calling the honor, the loud cheers of support, and the first lady's message "wildly overwhelming." "I didn't prepare a speech because I really wanted to see what would happen when I got up here and tried to speak from the heart," he explained. "I'm 24, and to be receiving something like this at my age, it feels… a little early to get something like this, but my God doesn't make mistakes, and I like to think he's putting this enormous pressure on me to see how I react." "I had plans originally to tell the world, and everybody watching, how to make this a better place; to tell everybody in this government that you all need to let everybody out of jail for selling weed before y'all start making it legal for people to sell it," Chance passionately shared as members of the audience got to their feet to cheer him on. "I was gonna tell the Chicago public school system not to take out a loan from Chase bank when they know that our schools are planning on failing in our district," he continued. "I was gonna tell those judges that we just need a conviction when you know these [bankers] are wrong for doing this." Chance concluded his impassioned speech saying that he believes "we have to work on ourselves, before we can work on the world. So I want to be a better father. I want to be a better father to [1-year-old daughter] Kensli, I want to spend more time with her." Chance said he wants be to be more involved with issues outside of just those in his community, and that he plans on traveling overseas to "help people all over the world."